While I've seen the impressive efforts of turbocity tom shoe-horning in a ZX system on the C14 (helpful photos BTW), I was curious if others had taken some other approaches to replacing that dang stock potato-launcher hanging off the back. I know its only been a short lifespan so far for the C14, but didn't know if there was some consensus on a fix for this, now that the 2011 model has fixed so many other things, like the heat issues etc. "Those who say it can't be done shouldn't interrupt the person doing it"
I very well could have the wrong brand but I think I have seen a Jardines exhaust on several Concours. Very slick looking compared to the original. In my research, I have seen pictures of several C14 with ZX14 aftermarket exhast ( I think they were Two Bros exhaust) using the factory ZX14 header. I will go that way some day. The factory ZX exhaust is VERY quite. The aftermarket mufflers are smaller than the ZX14 stockers and are easier to fit. They just cost a lot more. 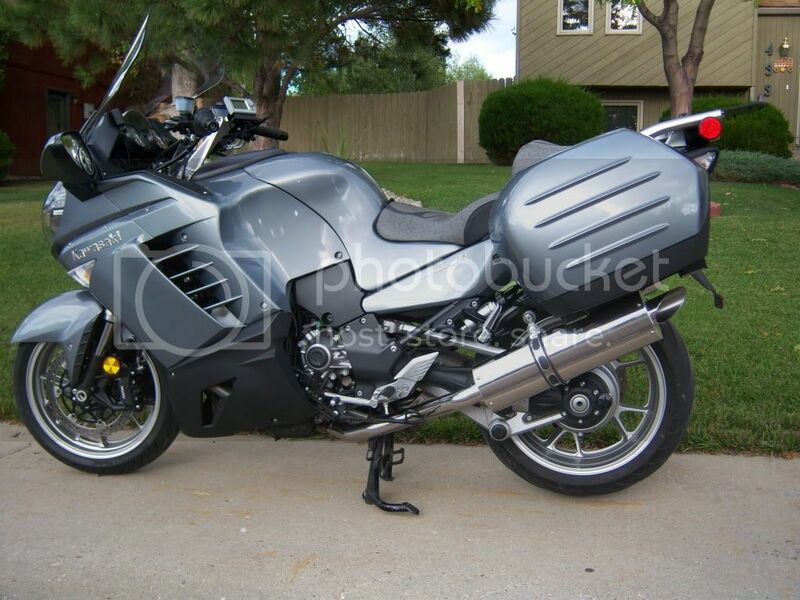 I did the complete ZX14 exhaust for $150.00 off e-bay. I did look for a long time to find a complete, perfect system. Area-P is a popular mod but there are other farkles that had a higher priority for me. http://www.areapnolimits.com/products/Slip-On-Exhaust-Kawasaki-Concours-14-2008.php You can't see the exhaust when you're cranking through the gears, grinning from ear to ear. There are collectively several million trouble free miles on the C-14. Get it. Ride it. IMO it's a no win proposal. The OEM exhaust is less than flattering looking and heavy. But it's quiet, which is good IMO! 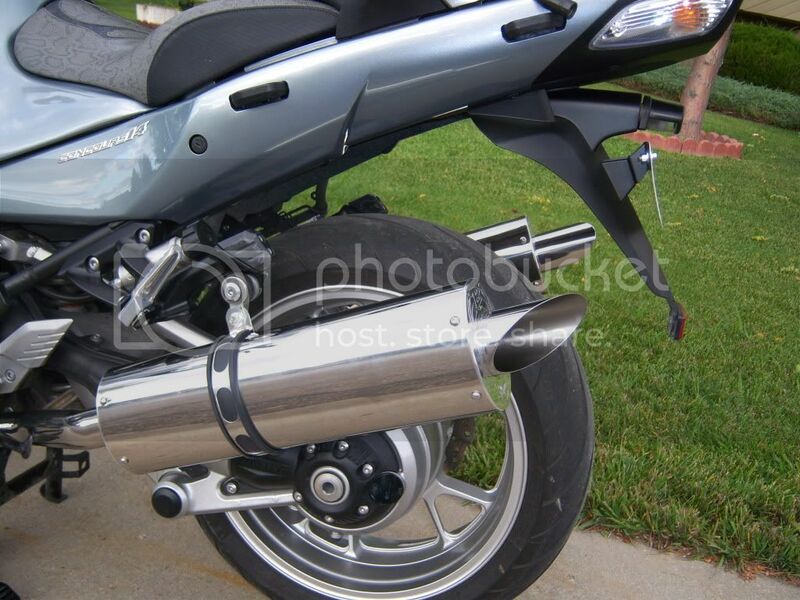 The ZX14 exhaust you will have to buy if you can find a good price. Then you will have to spend the time and trouble to install it. IIRC the ZX14 exhaust might actually be heavier than the C14's howitzer. You will also need to remove or modify the center stand to install it. The aftermarket exhaust are very pricey, depending on how extravagant you get. You can get a full single or dual exhaust from them. The dual will be expensive (Again IMO). They will also require something with the center stand. But if you have lots of money, you can buy one of them too! IMO the easiest and arguably the most cost effective is probably an aftermarket slip on can. If you can find a used setup, it's even less expensive. Some of them are pretty quiet. I personally went with the stainless steel Area -P . It was very good looking and lighter. But again $400+ isn't cheep in my book either. Now I used the slip on for a while and liked it. 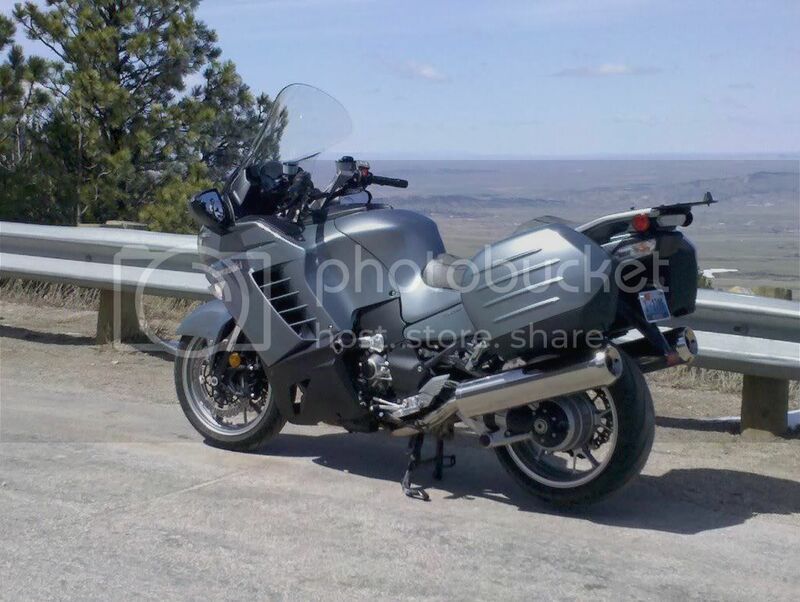 Then I took a 2,800 mile trip with it on the bike. It really wasn't bad. But in my case, there was a slight droning that got to me after a while. When I got back, I removed the slip on and reinstalled the howitzer. After using it for a short time, I decided that I liked the quiet better than the look. So I sold the slip on. I was then happy and accepted the less than stellar look of the howitzer! Some people have cut down the howitzer slightly and or painted the caps to make it more acceptable. But in my case, the best result was leaving it stock. Although if had gone with the ZX14 set up, maybe I would have left it alone. Now here's what I feel is very important. If you plan on trading or selling the bike down the line. You'll probably be better off returning it to stock form. 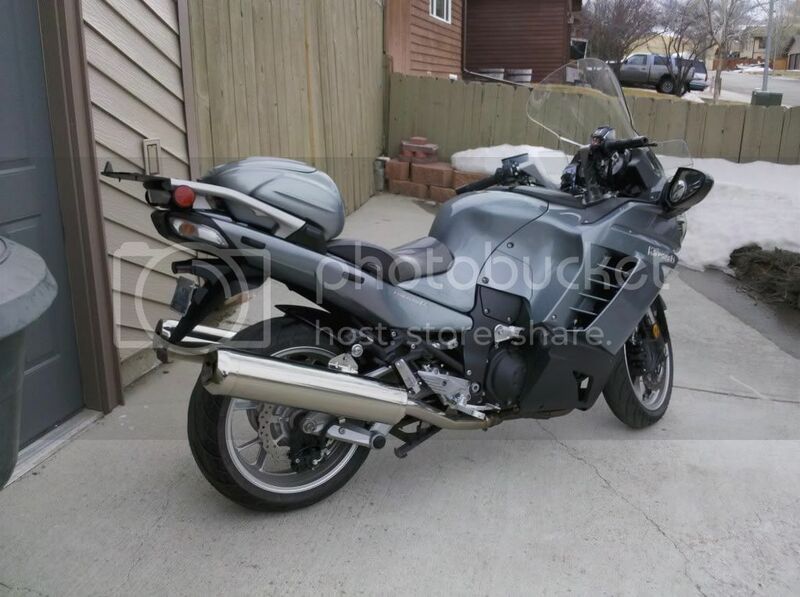 IMO, It's easier to sell or trade a bike that is in as close to stock condition as possible. So then maybe the slip on may be better. Decisions, decisions! I've always told new riders concerned about looks that the view from the saddle is all pretty much the same, and I need to remind myself of the same thing. I mean, I own a Pacific Coast for goodness sakes! That being said, boy that C14 can is a honker. I think it bothers me more that it extends well past the rear wheel, than its circumference. But realistically, from a price point, my Y2K C10 was $7k out the door and now only has 50,000 on the clock, so I (and my wife) feel that I could probably dump a lot of $$ and time into the C10 before justifying the cost of a C14. And with a dearth of good mechanical support here in central NC, I would also be inheriting the mechanical duties on a much more complex machine. Maybe I could get the dealer to throw in tuition for AMI? the stock Zx14 exhaust fits perfect, but you'll have to fabricate a left exhaust hanger. Keep the rubber side down !!!! That look great, not to steal the thread but what seat is that you have on the bike? Looks nice and comfortable! Looking at the photo's, it's a Corbin with a custom seat pattern on it. The rear section is the Corbin Smuggler! Looks nice doesn't it! find was the Two Brothers. Nice looking compared to OEM but almost $500. I have a complete 2006 ZX-14 exhaust system sitting in my garage that I think I paid about $275 for. I just haven't decided yet if I want to install it. I did weigh it, and the two individual exhaust pipes are indeed heavier than the single potato launcher. They also have catalytic converters inside them, and the OEM potato launcher doesn't, since it's cats are in the header. While I do like the looks of the duals better, I've just about gotten used to the looks of the potato cannon, so I haven't yet bothered to install the ZX-14 system. I also like the quietness of the OEM system, and the centerstand modification is another hurdle. I think the sidestand may also have to be modified. I'm just not sure it's worth the effort. I pulled my Two Bros titanium slip-on muffler off my 2008 before trading up to my 2010. I liked the look of the Two Bros and the sound was nice, but certainly louder. The increased sound never bothered my on long trips as the wind noise is just as loud if not louder, thus I always use ear plugs on long trips. I have not installed the Two Bros on my 2010 yet as the new stock can is noticeably shorter and better looking than the old stock can. It's also very quiet. I'm going to give the stock can some time before I decide to install the Two Bros. The bottom line... I have been pleased with my Two Bros. Here is a photo of my 2008 with the 2 Brothers. I am not into loud and it is. I started the bike in the garage with the bike facing the open double door. My kid came out because the picture on the wall in the bathroom on the other side of the front garage wall was rattling. It is a deep throbbing sound. It is definitely louder than stock and may affect your fellow riders behind you. It is winter in Colorado yet, so have not had a chance to group ride as I just got it last Friday.